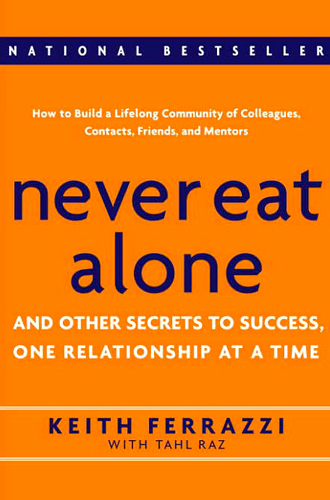 We continue our examination of the business book Never Eat Alone with an interview of author Keith Ferrazzi. What inspired the book, and how has this age of Twitter and Facebook changed networking? What was the impetus for you to write Never Eat Alone? It was an article written about me in Inc. Magazine called “10 Secrets of a Master Networker” that got an such a huge groundswell of attention that it became very clear that what I had learned organically from my father and a number of mentors along the way was alien to too many professionals in the world today–and yet increasingly important. Never before has social capital and collaboration been more a core part of getting things done. And yet it’s a space that has been largely ignored when it comes to education and training, too often left to chance. What I knew is that a relationship-centric approach could be taught and that it was not just some magical art form. Never Eat Alone was my first stab at teaching people the mindsets, process, and skills they need to achieve everything they want in life. Why do you think the book was so successful and resonated in the way that it did? From the beginning we (me and Tahl Raz my coauthor) defied everyone’s fears and concerns about the word “networking.” A word I don’t like by the way because of much of the negative connotation assigned to it–insincere, self-interested, etc. Yet, business relationships are just personal relationships in a business environment. Or they should be. So we came out and said the most important element of networking is building authentic, intimate relationships. And that to do so we need to lead with generosity, asking the question, how can I help you! We talked also about knowing how to ask for help among your friends. These are powerful ideas underserved in the professional world by all but the most enlightened and successful. But the book was only the beginning. The richness of the training we’re able to offer at RelationshipMastersAcademy.com can help people at an entirely different level. I’m amazed today at the powerful ways we can share information and teach online. I’m on a mission to bring these ideas in service of careers, sales and leadership to professionals around the world, and excited about the new tools I’m using, my online academy being the major one. Has the rise of Facebook and Twitter changed any of the ideas you had in Never Eat Alone? Not changed but made them even more critical. Social media is just a medium for connecting, and an awesome one at that. But many engage in social media in a self- serving and superfluous manner. The rules from Never Eat Alone and Who’s Got Your Back still apply. In fact, because of social media I now have the ability to sustain connection with a much broader group of individuals. I have access to information about people that allows me to serve them in a richer way and to bond with them deeper and more frequently. But I do have to say that many are going the other way–more superficial “connections” and not deeper relationships. My online program has a strong community/social media element precisely so that it can act as an incubator where people learn to be as generous and potentially as deeply-connected in their virtual interactions as their real-life ones. Again, this is an area that’s getting short-shrift in skills training. We have clients who are burying their heads in the sand and banning, instead of integrating, online relationship building. I want to change that. There are now Internet Celebrities (iJustine, Robert Scoble, etc.) whose personal brand is all over social networks. What are they doing right? They are doing the same thing Oprah did right. Connecting with people. There are personalities who are skin deep and those who feel like they belong in our living room. The public can smell the difference a mile away. You had sections devoted to historical connectors like Benjamin Franklin, but also modern connectors like Bill Clinton. Has anyone emerged since the book’s release that you’d add to that list? I have had the good fortune to be exposed to personally are the thousands who are walking among us who are the real “relationship masters.” People who come up to me after a talk or in our academy and thank me for saying that this is the way business should be conducted because even though it has always been their belief, they haven’t found the courage to fight the sometimes contrary evidence of the jackass who periodically is part of their business life. It’s all in the story! When writing Never Eat Alone, I fought against almost everything that made NEA a success. “Who wants to hear about my childhood?” I’d say to Tahl. I thought that everyone just wanted the facts and the formula. But as my mentor Peter Guber (Chairman of Mandalay Entertainment) says, “stories are emotional transportation.” A big part of my work is to make people want to hear what they need to do and the story is the hook. I go back to the good oldies, Dale Carnegie, Napoleon Hill, Stephen Covey. Or even go to the great religious books of all cultures. Learn to be a human first. Everything else follows. 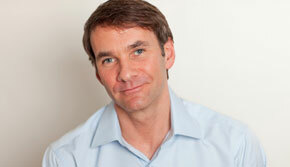 Keith Ferrazzi is the author of Never Eat Alone: And Other Secrets to Success, One Relationship at a Time, published by Crown Business. Read more about Never Eat Alone or our Leadership Hall of Fame.